The Scottish Surfing Championships began to “rotate” from 1976 between Fraserburgh, Pease Bay and Thurso. 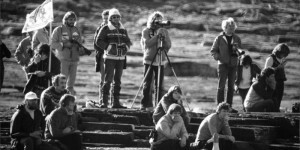 When the event came back to Fraserburgh in 1978, there was the top surfers in Europe at the time up as judges (Nigel Semmens and Steve Daniel to name but two) and the surf photographer, Alex Williams wrote an article for Atlantic Surfer, the UK surfing magazine of the era. The Scottish Surf Team to Eurosurf 1975, in France had representation from across Scotland. After that, Scotland was properly represented at every Eurosurf until 1995. Between 1975 and 1989, the Scottish Surfing Federation was largely run by older and experienced people, notably Billy Batten, Andy Bennetts, Ian Wishart from ‘Pease Bay Club’, Davie Long and Brad Robertson from Kirkintilloch, Malcolm Findlay, Billy Duncan, Iain Masson from Fraserburgh, Pat Keiran, Barbara Wilson, and Sheila Finlayson from Thurso. Meetings were held quarterly with there being a President, Secretary, Treasurer and representatives from the North, North East, South East and South West. Scotland was always represented on the British Surfing Association (BSA) Executive Committee. T he “Golden Age” of the SSF was during the late 1970s and early 1980’s. Membership grew; there was a lively, regular and well-organised regime of events. Scotland hosted a very succesful Eurosurf in 1981, under the presidency of Bill Batten who was a superb President (as well as an international standard surf judge).